Get smart! Have fun! Be a bright spark and sharpen up your brain with quirky puzzles for clever little minds. These cheerful brain games have been specially created to help your mind stay nimble and quick. Whenever you pull out a card, you pick an energetic puzzle which will get your brain trained up in no time. 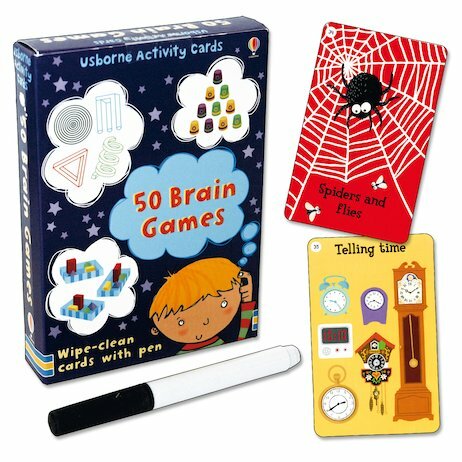 Whether you’re telling the time, spotting the difference, counting things or exploring a maze, hopping through the fun-packed games in this box will keep your brain on tip-top form for school. Oh – and when you’re done, just wipe each card clean to use it again and again. Box contains 50 wipe-clean activity cards illustrated with colour cartoon pictures, plus a wipe-off pen.